During the month of May, our students have engaged deeply in their creativity, collaboration, communication, and critical thinking while working with Lego Robotics. Students have collected and analyzed data and have worked hard on engineering design. Late last month our students participated in the “Can Do” Challenge, a competition where robots are programmed with a light sensor to knock 5 cans out of a ring in 3 minutes or less. This year we saw the most innovative designs ever, and we had many record setting performances. We were proud of all of our students who took innovation to new levels. 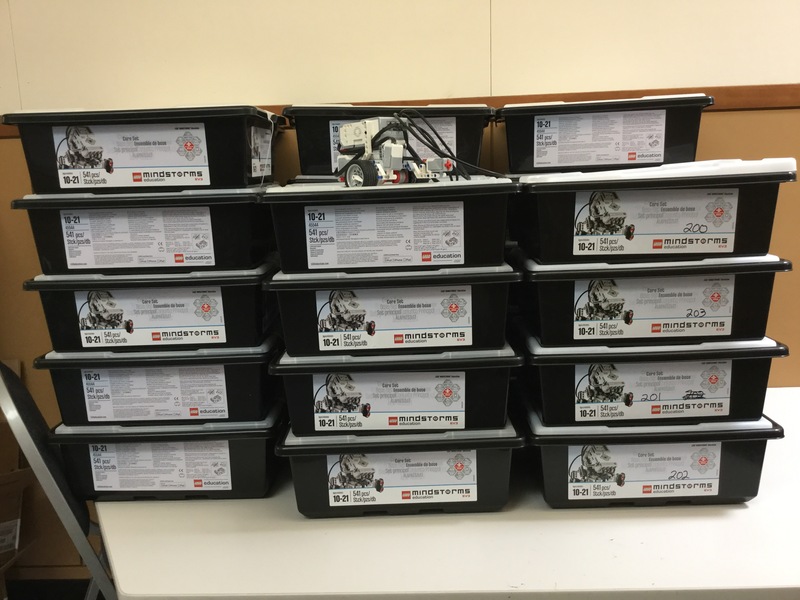 Our students are off and running with the new EV3 Robotics kits. Students are working in groups of three. The 5 C’s of Critical Thinking, Collaboration, Communication, Creativity, and Citizenship form a foundation of our program. Mathematics skills and concepts involving graphing, geometry, measurement, and statistics are embedded continuously as they solve tasks to learn necessary programming skills needed for meeting more complex challenges. When they master the initial set of tasks, they earn their EV3 Robotics Driver’s Licenses. Student engagement has been high and there’s more fun ahead. Oregon Massage Clinic is hosting the Newberg High School Robotics Team during Art Walk on November 4th from 5 pm to 9 pm. Team members will be there with their robots and will be available for answering questions. This is a great opportunity for students interested in robotics to see up close learning opportunities that lie ahead for them in a few years. Next, students will explore ultrasonic sensors! Our students have had a busy week with robotics. Aside from learning programming commands, they are getting a good work out with the “M” in STEM by recording data, learning about percentages, calculating averages, measuring metric distances, and graphing data. Students are also learning about collaboration skills as well as steps in problem solving through obstacles such as software issues and programming errors. Next week students will begin exploring light sensors and they will be presented with a challenge project that will culminate with a competition on May 31st. More on that will be posted soon! It’s already that time of year! Students are building their training bots today and will start programming tasks this week and they will soon be exploring how to use light sensors. Stay tuned for more updates! Our final robotics challenge involved robotics teams using a touch sensor. Robots were programmed to travel a distance and touch a 2×4. When contact was made with the programmed touch sensor, the robot had to turn around and travel another distance to some cones. Sections of the 2×4 as well as the cones were worth various point values. Our students did a great job this year with their creativity, collaboration, critical thinking, communication, and citizenship.